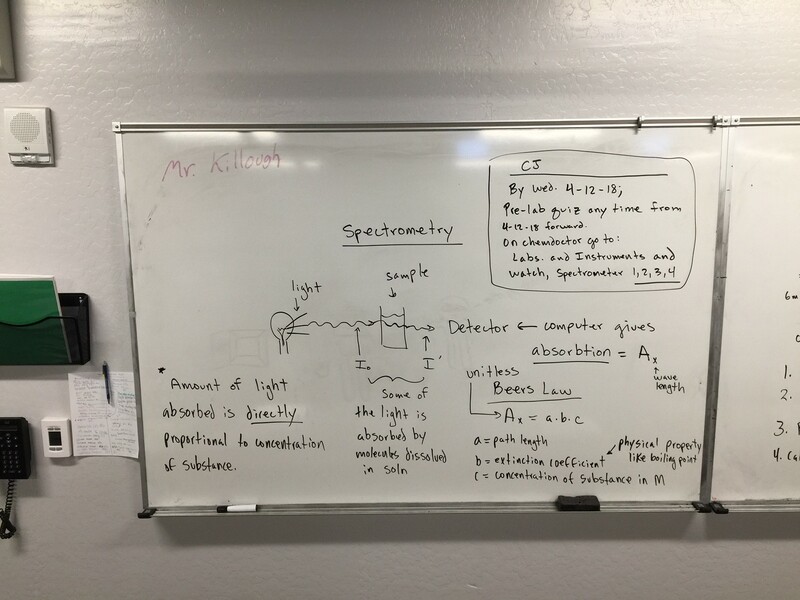 Week 4-10-18: Spectrometer Lab: Go to Laboratory and Instruments and watch Spectrometer 1, 2, 3, 4. 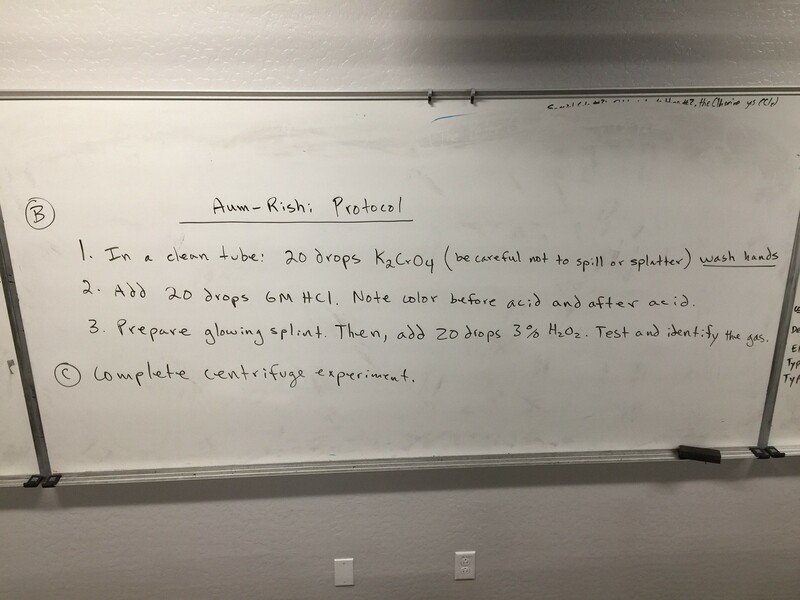 Graded labs possible after 4-12-18. Week 3-26-18: 2% Extra Credit T3 for 2 gallons distilled water delivered by Friday of this week. 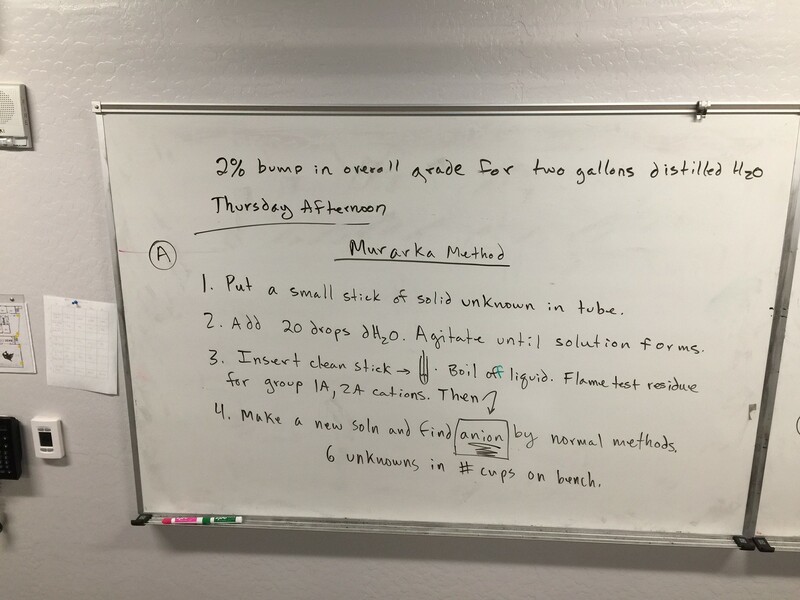 White Boarding gases. Key to % mass compound B in sand mixture: Down load and print. You will have this graded lab again and copies WILL NOT BE PROVIDED IN CLASS. Tuesday, week of 2-20-18; Go to link: Intermolecular Forces/Bonds; watch all the videos under this link including Heating Curve of Water. Thur and Friday, 2-1-18: Graded Labs with questions on redox and net ionic equations. Monday and Tuesday, 1-29/30-18; Neutralization Lab in class. Video assignment out of class:Go to link: Oxidation Reduction. Watch: Identifying Redox equations, Oxidation reactions explained, redox examples, oxidation numbers in compounds. Wed., 1-23-18: Precomp scores entered in CJ; Redox reactions, then white board. 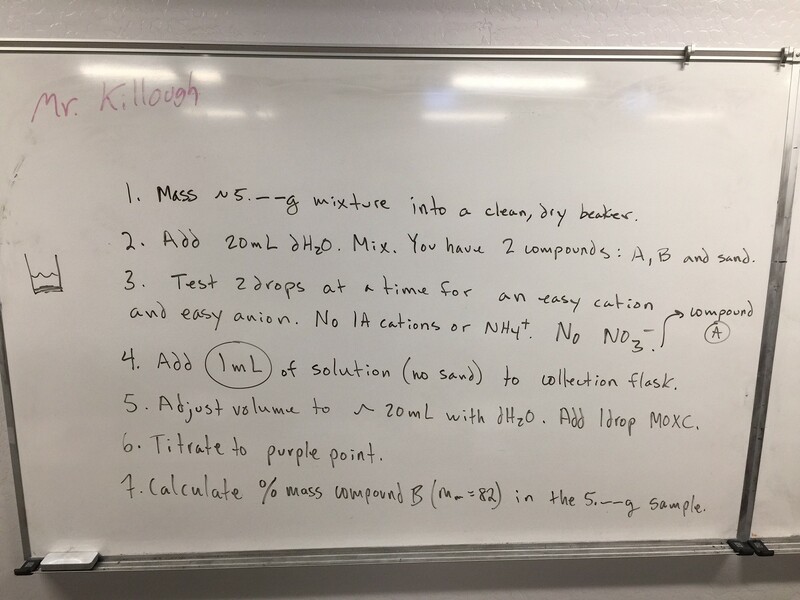 Monday and Tueday, 12-18-17; Graded Lab–permanganate. Why is the end point pink? When titrating iron (II) sulfate hepta hydrate, why does the solution turn yellow as the end point is approached? Why does the red color disappear before the end point? Why is a minimum of 25 mL of sulfuric acid used to set up the titration? Why do you subtract the volume of a drop off the volume dispensed after reaching the end point of the titration. A student adds ten mL of .02M permanganate to a sample containing peroxide solution. The solution remains clear after the addition of the permanganate. Which reactant is limiting? Which reactant is in excess? Can you calculate mass of iron (II) sulfate hepta hydrate reacted? Can you find the molarity of a peroxide solution? 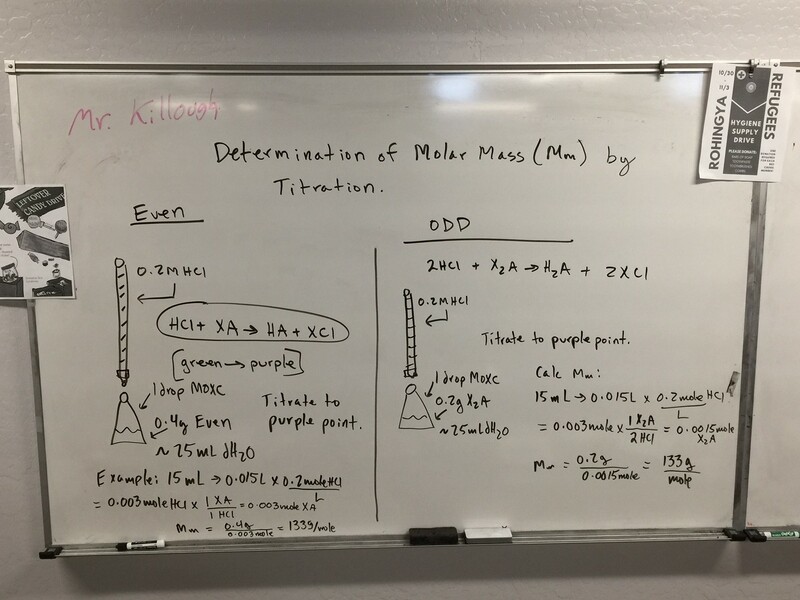 Thursday; More practice solution redox titration. Precomp Review: Update–there is no limiting reactant problems on the native exam. Wed., Prep for graded lab. Find molarity of hydrogen peroxide solution given balanced equation. Monday, 12-11-17; Permanganate Lab. Molarity of MnO4- and finding Iron. Expect graded lab this week. Thursday and Friday: Permanganate LaB. 1) Determine the concentration of KMnO4. 2) Determination of Iron. 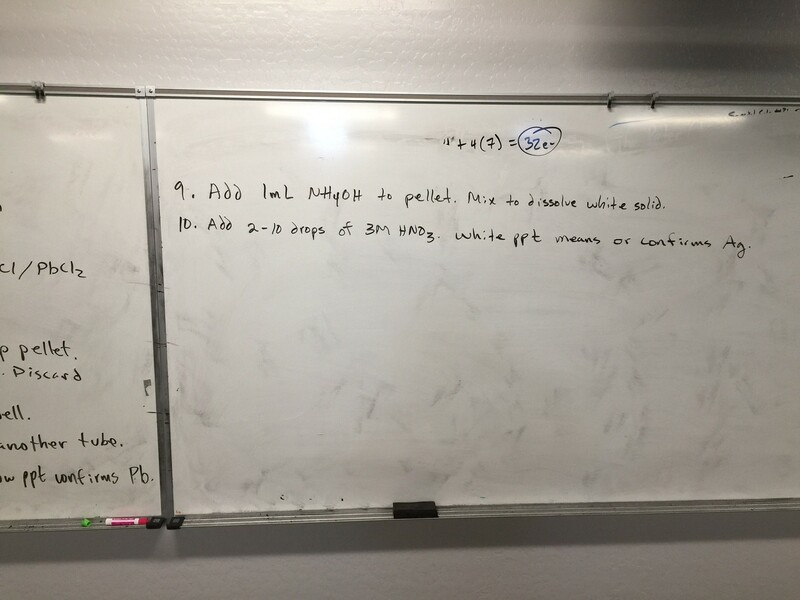 Wed.’ 12-6-17; white board today on molarity; Thur. and Fri. 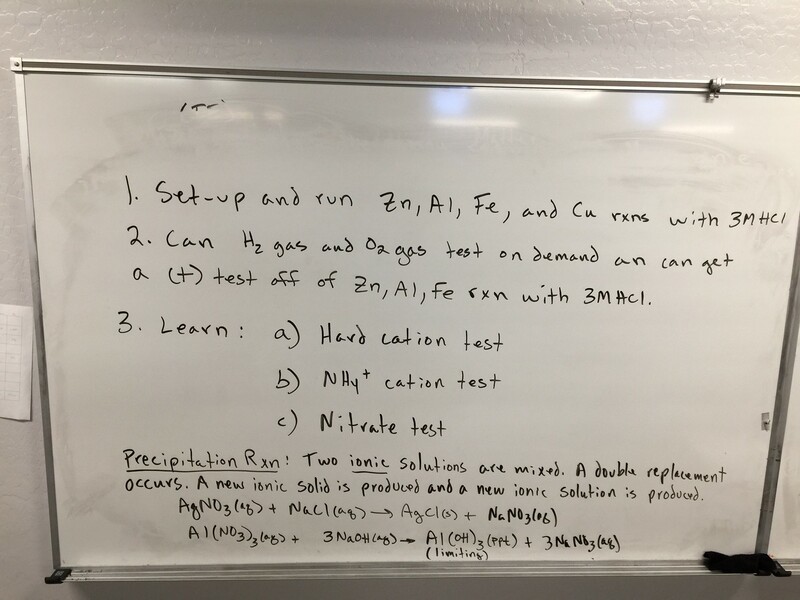 Lab: Go to Laboratories and Instruments and watch 1) permanganate lab set up and 2) finding iron… before Thursday. 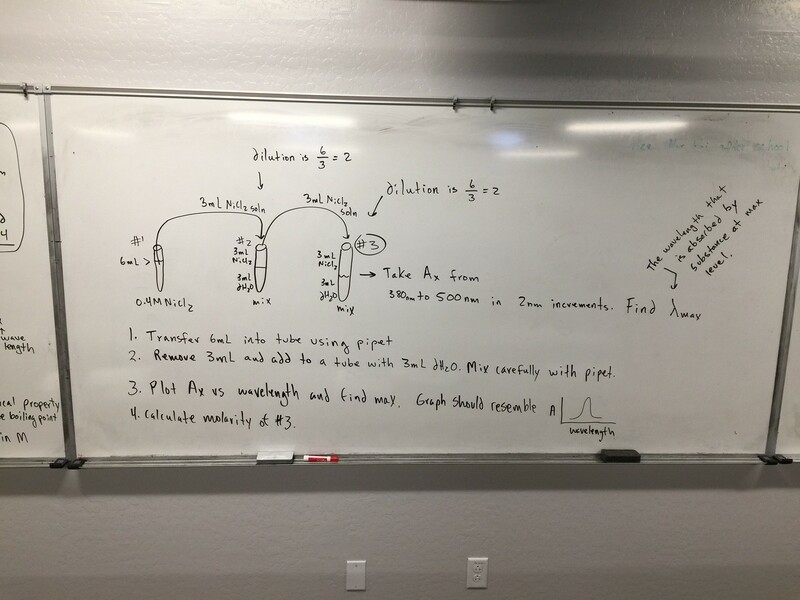 Monday and Tuesday, 12-4-17; Theoretical Yield and LR using the concept Molarity; Watch the following videos: Got to: Molarity Defined and watch “solution molarity define” and “molarity calculations by dilution” then Go to: Theoretical Yield and Limiting Reactant and watch “Limiting reactant with mass and molarity”; Quiz third day of class over this material. Monday, 11-28-17; stoichiometry II 1-17-17; At this point you have watched the videos and learned the concept, Limiting Reactant. 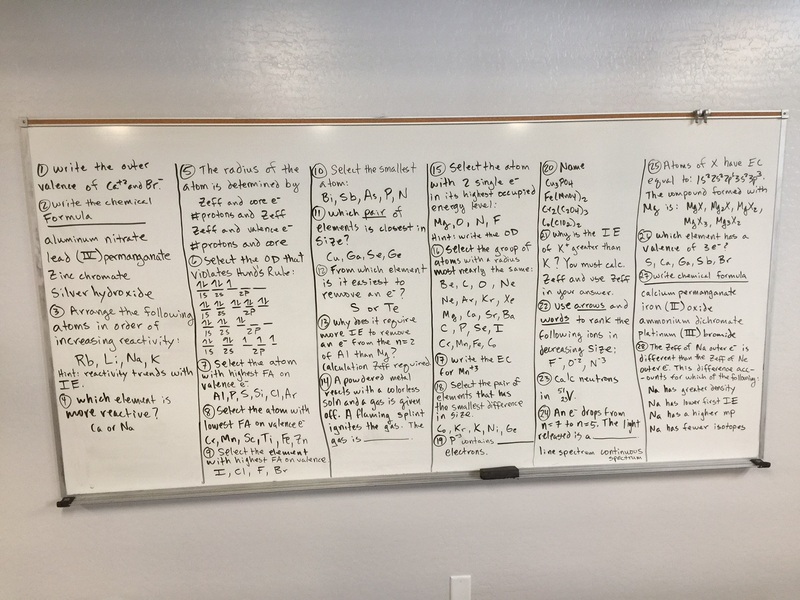 One example will be worked in class and then you will white board. Expect a quiz on day three of class this week. See packet on limiting reactants linked above. For Monday or Tuesday depending on class it is mandatory that you watch: The following videos are found at Theoretical Yield and Limiting Reactant: Practice with limiting reactants 2, practice with limiting reactants 3, practice with limiting reactants 4, limiting reactant mass remaining reactant. Monday and Tuesday, 11-13-17: Quiz on Third day of class (If you do not have the video work done by wed. you may do really bad on the quiz concerning LRs). Theo yield, % yield, mass other reactant, limiting reactant.The following videos are found at Theoretical Yield and Limiting Reactant: Practice with limiting reactants 2, practice with limiting reactants 3, practice with limiting reactants 4, limiting reactant mass remaining reactant. Watch before wednesday 11-15-17. Weekend, 11-4/5-17: Study for upcoming test. White Boards to be loaded this afternoon. Wednesday, 11-1-17: White Board Review-All classes. Assignment: Go to Link: Theoretical Yield and Limiting Reactant and watch, 1) Theoretical Yield #1 in series, 2) % yield and mass other reactant #2 in series, 3) more on theo yield-mass other reactant. This content will NOT be presented in class. The class is flipped. You are responsible to know this. Next presentation will start directly with limiting reactant. Thursday and Friday; 10-26-17: Last opportunity to practice the AgCl and PbCl2 separation. Li has open ended graded lab–T2. 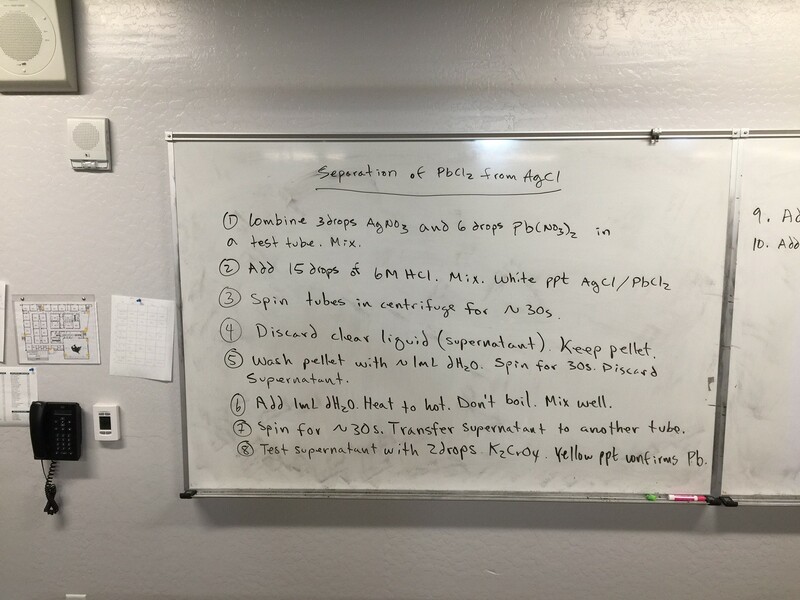 Wednesday, 10-18-17: White Board-LF and Shape; Thursday and Friday: Lab-Separation of AgCl solid from PbCl2 solid. Monday-Tuesday; 10-16 through 10-17-17: Lewis Formula Shape and Hybridization. Re-work Lewis Worksheet 2 by adding hybridization and shape to each molecule. Skip problems 16, 17, 18, 19. Thursday/ Friday Week 9-28-17:Lewis_Worksheet_2; Lab today: 1) Murarka Method 8 unknowns; Separation of AgCl from PbCl2.Separation PbCl2 from AgCl; Graded Labs next week. 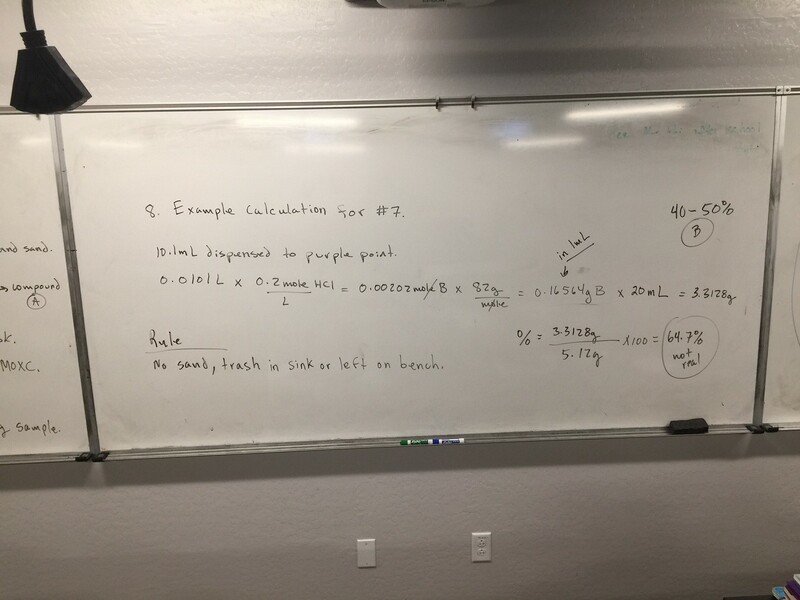 Wednesday, 9-27-17: Lewis Formulas–Violation of Octet Structures, then white board. Thursday and Friday; 9-21 and 22-17: Laboratory practice. Learn the Murarka Method for determining a 1A or 2A cation in an unknown. Weekend 9-16, 17-17: Study for Test. Wed., 9-13-17: All classes will White Board. Last period this week is laboratory. Possible graded lab. Weekend 9/9 through 9-10; Review Periodic Trends and watch “Understanding Ionization Energy and Effective Nuclear Charge” found under link: Periodic Trends. Graded Lab this week (9/7 and 9/8) Update: The unknown will have ONE Cation and TWO Anions. Week: 9/5 to 9/8: Today Grades will be entered in CJ’s; Graded labs happen this week on the last day of class for each chem 8 class. Week 8/28 to 9/1: Quiz last day of class this week. Quiz will cover everything listed here: Review Force of Attraction,Periodic Table and Trends 2017-2018 ,size of ions , Zeff of electrons that are not valence, sequential ionization and ionization energy. 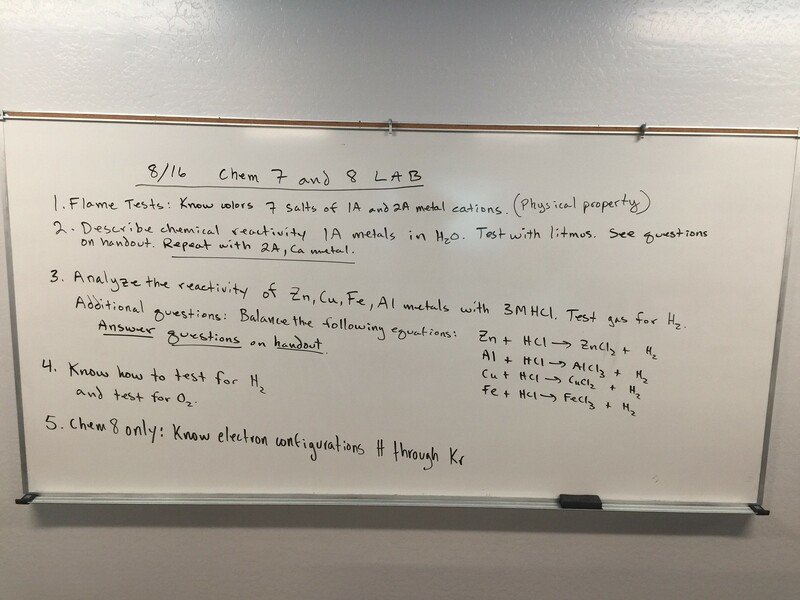 Week 8-21-2017: Quiz this week see below for topics; Topic outline is the following: flame test colors, states of matter (s,l,g), electron configuration H-Kr, separation of mixtures, chemical versus physical changes, hydrogen test, oxygen test, balancing the four reactions, alkali and alkaline metals, valence versus core electrons, reactivity of Zn, Al, Fe, Cu in HCl. Quiz Next Week: Thursday, August 24 for Sn and Cs; Friday, August 25 for Ni, Pu, Li; Quiz will cover atomic structure: see packets and watch two videos: click link Bohr Model and see Introduction to the Bohr Model #1 and Intro Bohr Model 2; Make sure to review lab questions, etc. below. Quiz Next Week: Thursday, August 24 for Sn and Cs; Friday, August 25 for Ni, Pu, Li; Quiz will cover atomic structure: see packets and watch two videos: click link Bohr Model and see Introduction to the Bohr Model #1 and Intro Bohr Model 2. Quiz: Thursday for Sn, Cs; Friday for Ni, Pu, Li. Quiz will cover mixtures, physical properties pure substances. See Comparison Pure Substances.